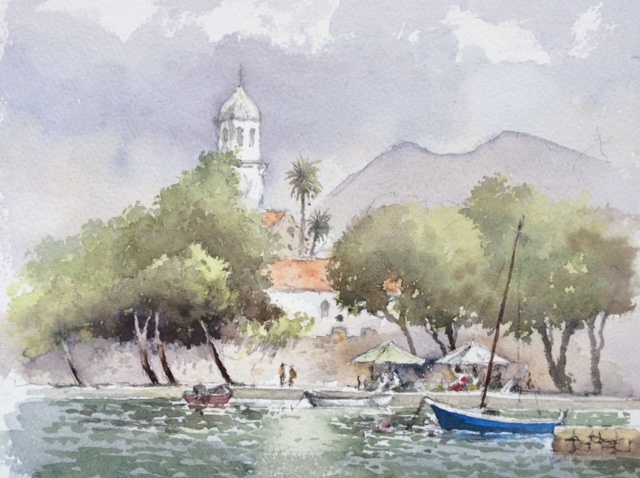 The sun beat down as I sat in a pleasant, shady spot beside Cavtat harbour demonstrating a watercolour, when Tarzan and Jane hove into view, both bronzed as they stood before us braz enly flexing their pectorals. Both were clad solely in thongs, otherwise naked and obligingly creating a combined landscape and life class all rolled into one. They moved round us, causing titters among the group, and at times my brush went distinctly wayward as I heaved with laughter at this incredible display of narcissistic clownery. Jane sat down in front of us, smiling like a Cheshire cat at the group, and presumably hoping someone would paint her. This sort of distraction can un-nerve the alfresco artist, but the group chuckled valiantly and took it in their stride, producing some excellent work. Later in the week I demonstrated again in Dubrovnik, which unfortunately was so choked with cruise-ship tourists that there was hardly room to swing a sable, and as I painted I did get hand-bagged several times. So, it was with relief we sailed to the island of Sipan where I found a shady spot to demonstrate watercolour pencils. An old bicycle formed an excellent centre of interest – it was leaning against a wheelbarrow, which was leaning against the tree, so in the interests of simplicity I left out the barrow and about a million other equally exciting things lying around, to illustrate the need for keeping things simple. I faded out the buildings adjoining the old barn. The pencils were applied first in the various colours and then this was washed over with water, blending in the colours and then drawing into the wetness with a dark watercolour pencil where I wanted to emphasise details. If you feel your watercolours get a little out of control then try the watercolour pencils. This work was done on Bockingford 140-lb hot-pressed paper, an excellent surface for these pencils. Our annual Watercolour Seminar is just about upon us, and this year we are back in The Settlement in Pontypool, a superb venue. It takes place on Saturday 1st October and there are still places left if you feel like coming along. 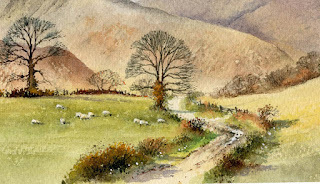 The theme will be injecting mood and drama into a landscape and I will be using the exciting range of watercolours from Daniel Smith, demonstrating how to take advantage of these amazing colours and give your paintings some extra zip. As well as a demonstration I will be giving an illustrated talk on the same theme, covering a wide range of landscape subjects. Details of the seminar are on my website. We look forward to seeing you there. With such a lot of intense heat of late in Britain it’s been excellent for painting out of doors. 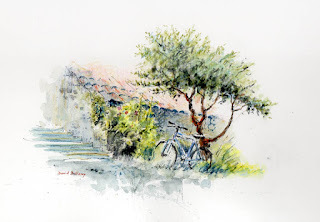 Getting out early in the morning or in the evening light is more preferable for those of you who find it just a little bit too hot, and finding some shade in the heat of the day is advisable, for the watercolour if not for the artist! Bright sunlight on white paper can really hurt your eyes, dry your washes too quickly, and give you a false sense of tonal values, so that when you return indoors your painting may look a little stark and contrasty. Take along and umbrella or other form of shade if you intend sitting in the sunshine to paint, and make sure it keeps your painting in shadow. A few weeks ago I was asked how to depict intense heat in a painting. 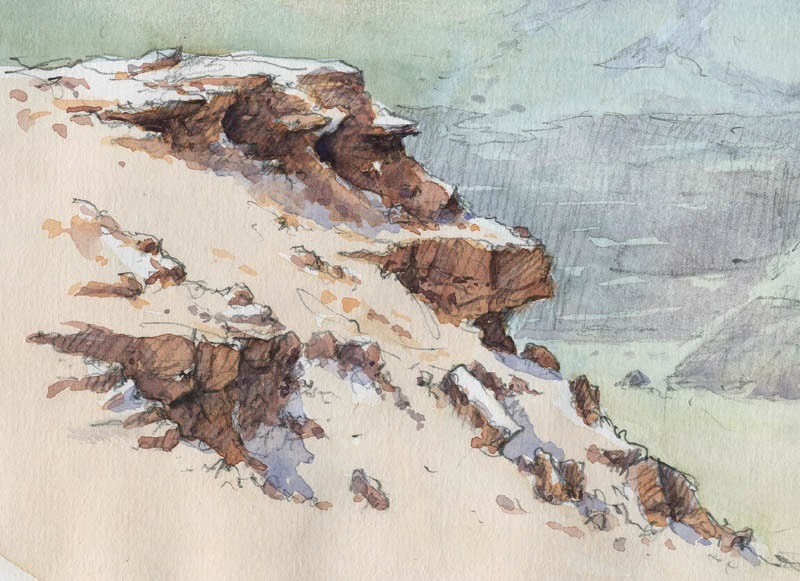 In this watercolour sketch I left much of the tops of the rocks as white paper, with much stronger tones on the sides forming a strong contrast. There was much more detail present, but adding too much detail can destroy the suggestion of sunlight, so keep it to a minimum in the lit areas. Cast shadows highlight the sunny effect, but here the sun is almost directly overhead, so there is not any great length to the shadows. The sense of intense heat has been further enhanced by laying a weak wash of blue-grey over the background. The sun beat down every day on our recent landscape course at Builth Wells, although happily we did have some welcome fluffy white clouds at times for variation. 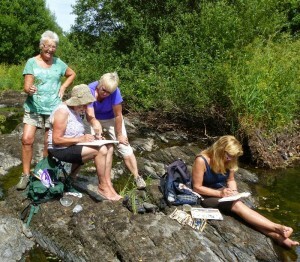 The ideal spot was down by the river running through the hotel grounds, where several students took the opportunity to dangle their feet in the water while they sketched. In the photo Jenny is giving advice as they paint a mixture of delightful cascades and still water punctuated with stunning colour reflections. Make the most of this lovely sketching weather. With the current heatwave hitting the British Isles I reckon it’s rather nice to remind ourselves of those lovely cooling days of English drizzle. I’ve been working on sunny landscapes recently and will feature some in future blogs, but for the moment I’d like to discuss counterchange, an interesting feature that someone brought up recently. Counterchange in a landscape scene is a very effective way of adding interest to a passage or solving a tonal problem. At its simplest it could be a change in tone across a ridge, hill, forest, mountain, or any background mass to create a tonal range running from light on one side to dark on the other, while at the same time adjusting the sky in a similar way so that the dark part of the sky stands against the light part of the hill, and vice versa. 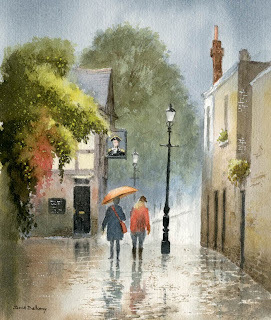 In this watercolour of a cobbled street in Hackney you can see I’ve used the method vertically on the right-hand wall just to the right of the lampost. In this instance I’ve included it for interest rather than to solve a problem. Where the method is extremely useful in solving a tonal problem can be, for example, where you have a house with a light-coloured wall set against a dark background: if the roof is dark it will get lost in the dark background, and if it is light it will lose itself against the light wall. By laying a graduated wash over the roof, darker at the bottom and graduating to a lighter top where the roof abuts the darker background, you can thus make both top and bottom of the roof stand out, thus causing a counterchange effect using the graduated wash. One of the most simple examples of counterchange can often be found on telegraph poles or winter tree-trunks where they show up light against dark vegetation at the bottom, and dark against the bright sky at the top, depending on the light of course. This particular painting is featured in my Skies, Light & Atmosphere book available on my website with a special offer package of book and DVD, available only from the site or my demonstrations. Don’t forget to watch out for these effects in the natural landscape when you are out and about. 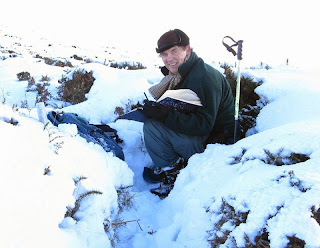 You can learn a lot even without your painting or sketching gear!